House Beautiful cover—plus a twelve-page feature. A great achievement for this thirty-year-old designer. Congratulations to the incredibly talented and beautiful San Francisco/Los Angeles interior designer Melissa Warner for her first major national feature and her first big-time cover story. 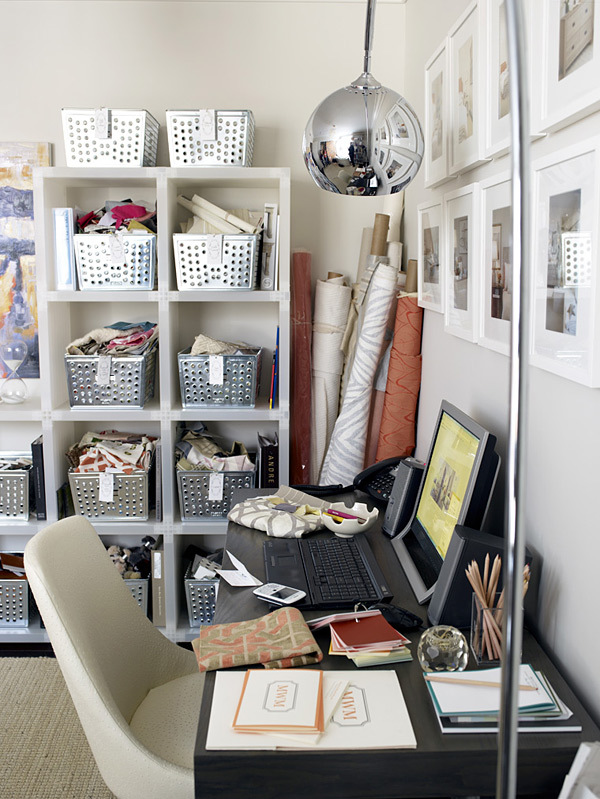 In the just-out May issue, House Beautiful presents her new West Hollywood pied-a-terre/ office in minute detail, illuminating and illustrating her design secrets and tips, her fabrics and art, even shooting the interior of her glamorous clothes closet. This is wonderful news for the hard-working, charming, and highly efficient Melissa, who is a partner in the young firm, Massucco Warner Miller Interior Design. It is also very encouraging for all new designers looking for exposure for their new work. Create it…and editors will be knocking on your door. 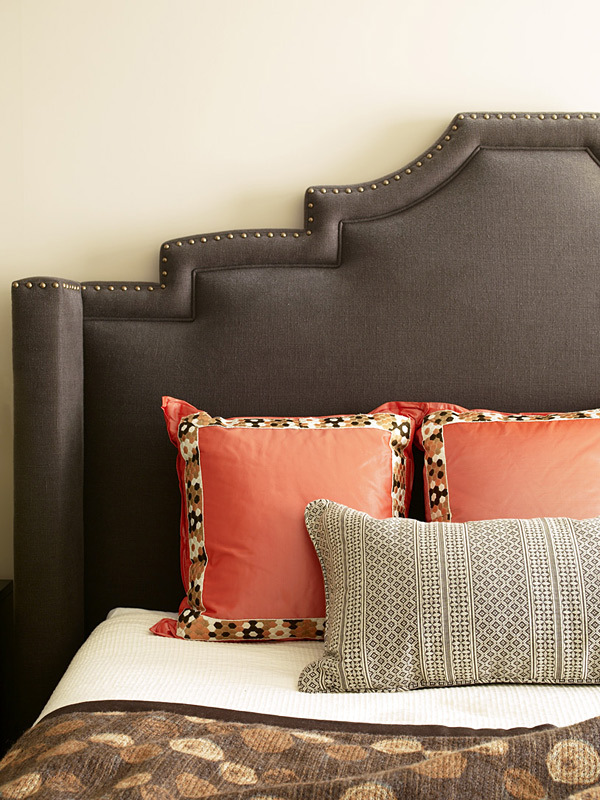 Melissa’s apartment décor is fresh, youthful, easy-breezy, and engagingly chic. Read on—and you’ll learn more about Melissa and her work—and find out how this fabulous photo shoot of her apartment actually happened. This behind-the-scenes story involves talent, boldness, energy, great style—and the kind of good luck that arrives when you’ve done all the hard work. Come with me and meet the great Melissa. Melissa, a Los Angeles native, studied business at the University of Colorado at Boulder and earned a second degree in Interior Design from FIDM in San Francisco.While working for two top San Francisco design firms, Melissa produced numerous high profile residential projects in New York, Miami and San Francisco before joining forces with Julie Massucco and Carrie Miller as Massucco Warner Miller Interior Design. After 8 years in San Francisco, Melissa now splits her time between San Francisco and Los Angeles, where MWM recently opened an office. DDS: Congratulations. Your Los Angeles apartment looks so wonderful on the cover of the May issue of House Beautiful—along with the vivid and inviting and fabulous 12-page feature. Wow! MW: Thank you! 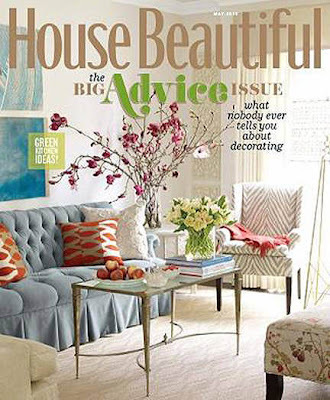 We would have been thrilled to have any mention in House Beautiful (one of our favorite magazines! ), but we were beyond excited to have such a thorough spread AND cover! My apartment is small, and it is a rental, so I did not expect such major coverage of every square inch. It is the most beautiful photography. I love Victoria Pearson’s work. DDS: You are just 30 years old. It is highly unusual for a 30-year-old designer to get a cover story and twelve pages in a leading design publication. Your career is rocketing forward. What reaction have you had so far? MW: I was just blown away by all the support and feedback! Everyone has been calling. It’s a total honor to be a part of the May issue…a great opportunity for us and we’re so grateful! I’m still pinching myself! We’ve had dozens and dozens of phone calls…from colleagues, from old friends, from potential clients, and resources and showrooms. All of the stores I frequent, my fabrics and furniture, the galleries and craftspeople who worked with me bringing together the apartment are also credited, so that makes me happy, too. MW: Yes. Absolutely.It all happened in the blink of an eye! It is vivid in my memory. I sent you the photos on Wednesday, the shoot was confirmed on Friday and House Beautiful’s Scot Schy flew out to L.A. the following Wednesday. So, the whole process from scouting shots to shoot happened in a week flat and I was in both LA and San Francisco working during that week! It was lucky for me that I didn’t have much time because I might have started frantically reupholstering and freshening everything up! 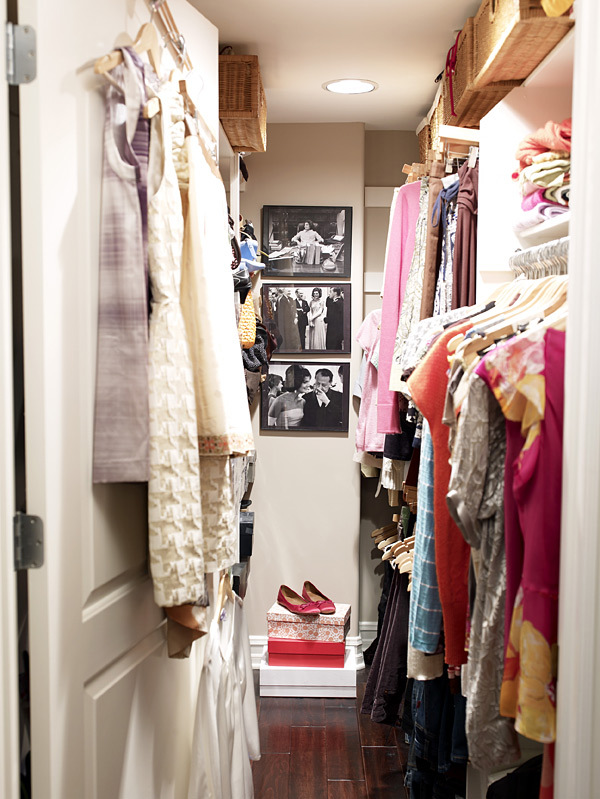 In the end, the apartment was photographed just as it was …. it was a good exercise for me in letting go! DDS: The photos are so fresh and light-filled and joyful. This was a fantastic collaboration, a two-day shoot with the photographer Victoria Pearson, and Scot Schy, House Beautiful’s Design Director, and you. I recall you said it was one of the best experiences in your life. MW: It was an amazing two days! My business partner Julie and I had so much fun with the House Beautiful team! The moment I met Scot (and his carload of flowers for the shoot!) I was at ease. He literally pulled up to my apartment the day before the shoot with practically a whole garden in his rental car. Not only did he do such a beautiful job with the flowers and styling, but he brought the most tasty snacks to the shoot, which I should add barely made it through the shoot since we all wanted to get our hands on those cupcakes! And, working with Victoria was a dream…the way she captured the light and the whole essence of the space was amazing! She and her team were so talented and professional. I felt incredibly lucky to work with them and the whole House Beautiful staff! DDS: Were you surprised when they shot every inch of your apartment—and it became a 12-page story? MW: Completely surprised! In my last minute prep for the shoot, I put everything that I saw as “clutter” away. 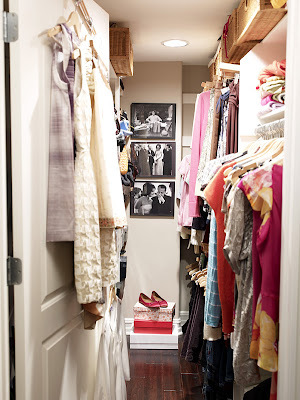 But, in the rush of it all, I did forget to put away the clothes that are forever hanging on my closet door. In my walk-through with Scot before the shot, I told him not to worry, that I’d have the clothes on the door put away in case they were shooting the room in that direction. He responded with “don’t move a thing…I like it exactly how it is!” That attitude really set the tone of the shoot, and Scot wanted to capture my apartment as it was...lived in. I think that direction really allowed the details to shine and it showcased the personality and energy of the space. DDS: The décor of the apartment is lovely. 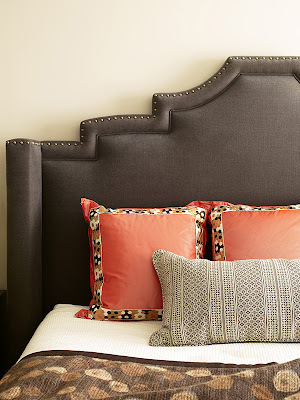 There are great custom-detailed pieces like the headboard, along with the tufted sofa—and there are some off-the-rack pieces (Ghost chair) that signify quick purchases, and a modern way of decorating. Precious pieces and some more mass-market, judiciously combined. MW: Trust me, if I owned a house and had the budget for it, I’d do everything custom because I love all the details so much! But, since this is a rental, I really wanted to do a mix of some special custom pieces and more off-the-rack instant gratification pieces. To me, the mix makes it practical, livable and approachable budget-wise. DDS: What do you love most about your apartment, now that it’s finished? 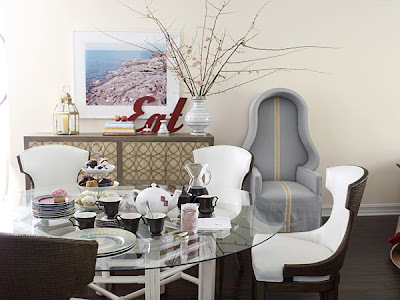 MW: The dining room! 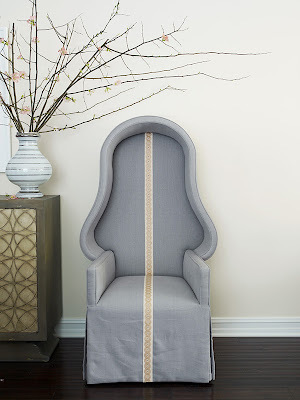 I was smitten with the canopy chair the moment I saw it (faded damask fabric and all) and I still can’t get enough of it! And the Massimo Vitali print above the buffet makes me feel like I’m on vacation. I just love the cheery vibe in general. I can’t help but be happy when I’m here! MW: I’m looking forward to some sun this summer and the new batch of projects Julie, Carrie and I are working on! We started Massucco Warner Miller in San Francisco in 2008 and expanded last year with offices in LA and Seattle. I love to travel and can’t wait to shop my heart out finding some great vintage pieces for our new clients in all three great cities! DDS: Thank you, Melissa. I wish you every happiness with your fabulous career. I know you will be fantastically successful. 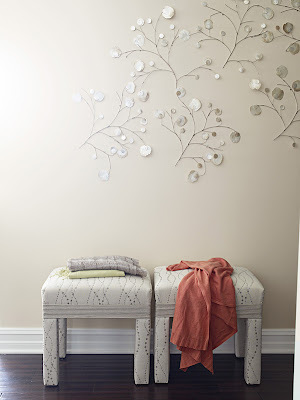 All photographs by Victoria Pearson for House Beautiful, used with permission. Styling and photo direction: Scot Schy. Editors: Newell Turner (Editor-in-Chief), Doretta Sperduto, Barbara King. I just loved this feature and cover, and though you might have had a hand in the process! Such beautiful a happy spaces!! What a wonderful post; and what a darling girl! Love everything about that apartment; and you have captured her energy and enthusiasm! She is brimming with the exuberance that makes our business so fun and joyful! Beautiful article, beautiful interview, beautiful designer, and BEAUTIFUL wardrobe! Thanks, Diane, for yet another fantastic post! Lovely to hear from you. I've been following Melissa and her charming and talented partners for some time (published some of their work earlier in San Francisco magazine)--and I'm so pleased to see Melissa on the cover of HB. It's every designer's dream. Penny--So wonderful to hear from you. Yes, she is a darling girl, as are her two lovely partners. Can you imagine, they founded their firm at the end of 2008, just when everything went south, design-wise. Yes, they quickly picked up great clients--and things are moving forward swiftly. Scott-yes, wasn't it great that Scot Schy, who directed this shoot--took us close up on her desk...and then zoomed into her closet. As I am sure you did...I zero'ed in on the photos of inspiration on the wall. Jackie-O! How cool. Watch for more great stories coming up. OH Diane! You are beyond! You are so ahead of the game! Brilliant....and you understand the whole thing about liveability! which is what my mother told me about long ago.....and why I became a decorator in the first place....40 years ago! "Make houses warm and lovely......make children feel comfortable and loved.......(litte pillows that are dogs and cats) make colors warm and cozy. You know what I mean...make it feel like THIS!!" Well.......that has been my design philosophy ever since that day! It sure works! That is not Mother Teresa....but it is actually; a worthy calling. The fact that I have created spaces for children to grow up in that are beautiful, and fun.......makes me happy and makes me feel I have made a real contribution! They will have taste in their background! You are obviously proud of Melissa and it shows in your post. I absolutely love how the photographer captured Melissa's work. I HAD to check out Victoria Pearson's website. I really could look at her images all day. The way Victoria captures the light is amazing and with truly exquisite results. Thanks for the post! Wonderful interview, effortlessly chic design, (so young!) and happy spaces..thanks for a further peek into Melissa's life and apartment! Wonderful post! Wonderful story and a great sneak at the inside of how the process can work for a designer to get published. It can happen so fast and be something that they were just looking for at the time. I loved reading about Melissa and her being so excited about everything. So refreshing! And as a fellow- 30 year old designer- I just love when young designers get attention! wow what a fantastic write up her place is amazing! "Make houses warm and lovely......make children feel comfortable and loved.......(little pillows that are dogs and cats) make colors warm and cozy. You know what I mean...make it feel like THIS!!" I love this. It should be on the wall to remind all designers. Make children loved...make houses warm and lovely. It is so important and essential. I love this thought. Thank you. Dear Sarah-You are a talented young woman, also. You are right that Melissa is a hard-working and talented young woman. The back story is indeed encouraging for anyone who wants to be published. Dear Kit--yes, for designers it does not have to take years to get into print. Yes, there are fewer publications--but it can happen. Dear Valorie-I loved your comment. And all joking aside--please send me the scouting shots and I will sort it out. I always encourage designers to send scouting images. My editors are endlessly requiring new features. I can't promise it would be published quite so speedily. My best to you and Alberto..Gpd speed. Dear Ashline-Melissa keeps saying...'it is just an apartment', meaning that a lot of the design is 'quick fixes'...so there are lots of great design ideas to steal here. DEAR GRANT_ You were in the New York Times at age 29...not too shabby. It was a full page story, as I recall. Bravo. And at 29, I published a feature on you in San Francisco magazine. I may have called you 'the new 'it' designer' but most likely I said you were the 'designer everyone was calling' and 'very directional. It is very encouraging today that editors are looking for great work. there are fewer publications and standards are very high--but if it is great, it will be published. Editors I work with shoot--and publish. They do not bank film--and especially they do not sit on it or years. They find the special place for it--shoot it--get it into print. Be optimistic...and send me your lo-res scouting film! Great story and I love Melissa's works. Thanks Diane! Fabulous post, I love the bit about Melissa doing the tidy up...can relate to that..and missing some. Just love the photo's of the rooms, gorgeous. I think Melissa and her partners will have a long career. I've known them all for some years--Carrie used to have a shop in Ross that I admired a lot, and she did a showcase room three years ago. So they have put in the work--and clients are snapping them up. terrific interview! her apartment is so inviting, fresh and chic. her dining room canopy chair is stunning. I don’t know if the gray chair looks cool or not because of its weird shape. The designer should’ve not put that straight line because the shape of it is already nice.